Learn how to log into your account here. Keep your library resources running! Access the Daily Mountain Eagle and Birmingham News with NewsBank! NewsBank gives you access to the Daily Mountain Eagle archives from October 1996 to today's edition. The World News update now gives you access to larger newspaper around the world, including the Birmingham News from 1992 to present, Atlanta Journal-Constitution, and many more! It's searchable by name, subject, writer, headline, and more! Access it using your CERL library card number on the back of your card. 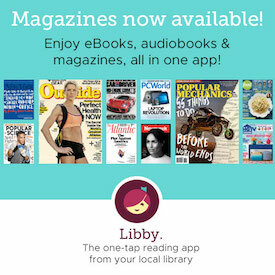 Check out Ebooks and Magazines Free! Ebooks, audiobooks, and magazines are available for download to your Kindle or mobile device through Camellia Net, a digital library for many Alabama libraries. All you need to check out and download is an internet connection, a valid library card from any Carl Elliott Regional Library branch, and free software available to transfer your downloaded materials to your Kindle, iPad, iPhone, or Android device. To log in to your account, use your library card number found on the back of your card and your PIN number. The default PIN is 1111 if you've never accessed your account on our website.